Agamemnon Set is a legendary armor set in Assassin’s Creed Odyssey. The Agamemnon legendary armor set in AC Odyssey comes as a reward for defeating one arm of the Cult of Kosmos, the looming threat over Greece. It is a Warrior set, that focuses on elemental buildup and fire damage. And it looks really cool and is very ornate, especially the helmet. The Agamemnon Legendary armor set bonus is pretty great, as are the bonuses of each individual piece. This guide is going to show you how to get the AC Odyssey Agamemnon legendary armor set, and stats and bonuses. 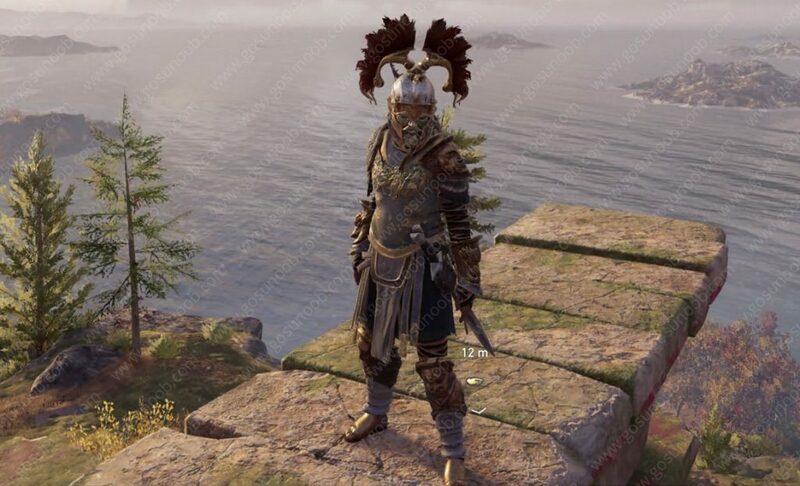 How to Get Agamemnon Legendary Armor Set in AC Odyssey? We got the Agamemnon Legendary Armor set by defeating one arm of the Cult of Kosmos. Specifically, the one called The Silver Vein. That’s the one on the middle left. They aren’t too difficult to kill, but still aren’t anything to be taken lightly. Every one of the cultists that you bring down will award you one piece of the armor, with the leader of the branch netting you the head armor. The Agamemnon Set of Legendary Armor in AC Odyssey is all about Warrior Damage and Elemental Buildup, mostly revolving around fire. First off, the Agamemnon Set bonus. If you collect and wear all the pieces of the Agamemnon Legendary set in AC Odyssey, you’ll get +50% Burning Rate; a wonderful bonus for anybody that tends to use fire a lot. The Agamemnon’s Helmet Legendary head armor offers +15% Warrior Damage and +20% Fire Damage. It requires level 45 to wear. The helmet completely covers your head and face. It’s full of gold inlays, and looks pretty intimidating. Next up we have Agamemnon’s Gauntlets Legendary Arms, which offer +15% Warrior Damage and +25% Elemental Buildup; also requiring level 45. They are awesome-looking golden arm guards, with what appear to be wolf heads. It’s pretty metal, literally and figuratively. Then, we have Agamemnon’s Body Armor, which is probably the coolest-looking part of the armor, aside from the helmet. Stat-wise, it offers +15% Warrior Damage and +5% seconds burning duration, and also requires level 45. Its white with gold inlays, and a magnificent illustration of two clashing armies. I absolutely love it. Agamemnon’s Waistband legendary waist armor is kinda the most boring part of the set. It offers the same stats as the body armor above, and require the same level. It’s basically a skirt with leather straps with gold embroideries. Lastly, we have Boots of Agamemnon legendary leg armor. This is by far the silliest part of this armor. First off, the stat bonuses are +15% to Warrior Damage and +20% Assassin Damage, strangely enough. The knee-pads have the face of Agamemnon on them, and the feet are actual golden feet. Like, molded feet. It’s completely ridiculous, and awesome at the same time. I’m having the same issue as you. I have only 3 of the 5 and killed all the Silver Vein. What are we supposed to do now? I have the gauntlets and wear them already when at lvl 25, so article is not correct, says u can only wear it at lvl 45……. Yes. I have them too. Only needs level 19 to wear. But they’re not as powerful as what is said here either. Since I mainly play with fire build (in case of fighting) this set is the best for me, but the article is misleading because I had the, chest, gauntlet, waist, and legging at a pretty low level(early 20) and I kept that set only until now(lvl 45) I’m just missing the head…..